They're Back: An image from 'Davey and Goliath's Snowboard Christmas,' the characters' first new production in nearly 30 years. Even today, the Hansen family still has no idea that Goliath is controlling their every action. As C.S. Lewis's Chronicles of Narnia franchise splashes across the big screen, I've begun to realize that my personal love/hate relationship with C.S. Lewis and his creations may, in fact, be the displacement of a deeper, darker discontent--one which, until now, I've only discussed with the closest and most carefully chosen confidants. For just as Lewis, when he was alive, "absolutely opposed" having Aslan, his Godly lion, caricatured in a film or television setting ("anthropomorphic animals," he wrote to a BBC producer, "when taken out of narrative into actual visibility, always turn into buffoonery or nightmare"), Art Clokey and I once took part in similar discussions during a licensing meeting between the creator and copyright-holders of two no less memorable animated icons. I'm talking, of course, about Gumby creator Clokey's beloved claymation avatars, Davey and Goliath. Indeed, nothing in my life, before or after the incidents I am about to recount, has so shaken my faith in the innate goodness of straight-talking, Jesus-loving, googly-eyed Christian creations. But before we begin this tale--this parable, if you will--of heartbreak and deceit at the highest levels of the Lutheran Church and the Claymation Universe, some background is in order. After all, there are some among us who have yet to experience the simple yet plaintive joys of Davey and Goliath, shocking as that cultural deprivation may seem to the rest of us. Not everyone was weaned on the original series or its decades of reruns, which since its 1960 debut has sporadically cropped up on off-brand TV channels during the wee hours of Sunday morning, a time of weary emptiness when even God might have cause to regret the creation of the rooster. Into this televisual no-man's-land of farm reports and program-length commercials came two puppetlike vessels of Christian morality: young Davey, a wide-eyed innocent with a surprising (albeit occasional) mean streak, and his dog Goliath, a talking mutt who spoke in a deep and vaguely goofy voice while uttering lines like, "Gee, DAAvey [Goliath always overenunciated that first syllable, especially when adopting a reproachful tone], you shouldn't hit your sister, because just as Jesus loves you, you should love your sister!" Goliath was clearly the star of the show, possessing an innate wisdom and moral compass far superior to his human counterpart. "I don't know, DAAvey," Goliath would caution, as we all watched Davey stumble into yet another moral lesson. The animated duo were the manifestation of a vision originally held by Franklin Clark Fry, then president of the United Lutheran Church in America (ULCA). In 1958, Fry decided to put aside a million dollars in order to fund the production of a TV series that would be distributed free of charge to television stations around the country, thereby using the relatively new medium to disseminate both the teachings and trademark of the Lutheran Church. When it came to Davey and Goliath, Clokey had to rein in any imaginative excesses so as not to offend the characters' religious sponsors over at the United Lutheran Church of America. Our semi-idealistic goal was to resurrect a Davey and Goliath franchise that had been long dormant. We had just made what, for us, was a ton of money putting together a CD for Disney's Hollywood Records called Lounge-A-Palooza. Having toiled in the shadows of The Mouse with some success, we looked around at a world that was spinning out of balance and decided (in a moment no doubt equally influenced by nostalgia and alcohol) that the solution was to bring Davey and--more importantly--Goliath back to life. The sad fact, of course, is that young Davey Hansen was always the dead weight of the D&G franchise. With his plastic hair, Osmonds image and whiney utterances, he embodied most of the drawbacks of claymation and few of its charms. By contrast, Goliath was the consummate stop-motion creation, prancing around with gangly elegance, his ears and eyes moving around in expressionist wonder. Goliath, we felt sure, was the key to the series' success and that of any future resurgence. With the exception of a few poorly distributed videos, the characters had all but disappeared from the cultural landscape, kept alive only in the memories of the faithful. So we naturally expected our proposals to be met with some combination of bewilderment and indifference by the folks at the Lutheran Church's headquarters in Chicago. What occurred was quite the opposite, a level of receptivity and downright enthusiasm that seemed almost good to be true. 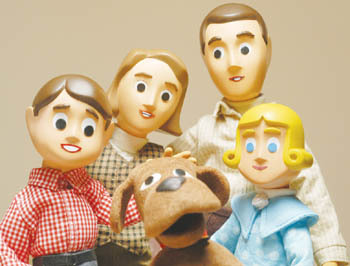 Within weeks, we were on board a flight from Los Angeles to Chicago, ready to usher in a new era of Davey and Goliath merchandise at a time when the Internet was making even the most obscure baby boom esoterica ripe for nostalgic exploitation. At each step along the way, we had asked our Lutheran hosts if the characters were truly free and clear--unencumbered by any third party licensing deals--and each time they assured us that they were. It was this assurance that got us to break our one cardinal rule of our business operation: Never use your own money. As absolutely wrong as putting the flights and hotels on our credit cards felt, we decided that a show of faith was in order. After all, these were church-folk we were dealing with. If you can't trust men of God, who can you trust? All this in spite of that voice barely audible in the distance, the one going, "I don't know, DAAvey ..."
Stepping into Lutheran HQ on a cold weekday morning, we were led into a conference room and introduced to the folks around the conference table. Among them were Art Clokey and his son Joe, a couple of Lutheran Church bigwigs and the guy to whom they had already contracted the rights to Davey and Goliath. If I'd had big floppy ears like Goliath, this would have been the moment when they stood on end as my eyes bulged out in unison. Not being claymation characters, we furtively glanced at each other with mounting horror as we were introduced to Arnie, a stubble-faced hustler who was brought in from New York City under similar pretexts. Although the licensing rights were already spoken for, we were told, we would be welcome to submit new proposals for limited subcontracting rights. Arnie, who appeared to have no actual interest in the characters themselves, professed his intention to sign on to whatever deal might be offered with the enthusiasm of a junkie in proximity to a fix: I'm in, he enthused. Whatever it is, I'm in. We left on an earlier flight, skipping the afternoon session and still uncertain what had happened to us. When questioned about the duplicity during the break, our host was apologetic but evasive; plus it was hard to get all self-righteous with the radiantly optimistic elder Clokey hovering nearby. We could, I suppose, have demanded they reimburse us for our traveling expenses--hammering them to the church door like some modern-day Martin Luther--but ultimately we were too disillusioned to do anything more than try to forget the whole thing. A year later, we got an unexpected email from the Lutherans: Davey and Goliath were back on the market. Were we interested? Still bitter, we never wrote back. But someone must have. In the years that have followed, Davey and Goliath have begun to experience a resurgence: a small flurry of bendable action figures and talking plush dolls, a new feature-length video in which Davey and his compadres go snowboarding, even a Mountain Dew commercial. Meanwhile the characters have been cropping up in other media: death-row inmate Sean Penn can be seen watching them in Dead Man Walking. Mad TV parodied the obvious Son of Sam parallels in a series of skits ("DAAvey, I need more blood! "), while the Simpsons' born-again neighbor Maude Flanders explained her son's refusal to watch Davey and Goliath, insisting that the idea of a talking dog is blasphemy. For us, however, the bitterest pill was their appearance in a Mountain Dew commercial. Still, you can only hold a grudge for so long, and I eventually realized that any anger I still held toward the Lutheran Church need not taint my love for their offspring. Finding the Goliath talking dog on eBay, I placed my bid and won him from a seller who had a surprisingly large supply. This small transaction, ironically enough, was itself a bit squirrelly: he'd complained to eBay that I hadn't paid; when I sent proof of payment, the doll arrived--months after the original purchase-- with a note explaining how to remedy a manufacturer's error which caused a number of the dolls to stop talking. I've since forgotten what that remedy was; and the doll has since stopped talking. To tell the truth, I can't even remember what it used to say. I'd read somewhere that it says, "I've sinned too, Davey," but sadly, that turned out not to be the case. It's been nearly a decade since the quest for Davey and Goliath began, and I'm still not sure what the moral of the story was. Was it to never invest your own money when you can use someone else's? Doubtful. After all, why bring together Art Clokey, a fistful of Lutherans and that guy Arnie all the way from New York City just to teach us a lesson we already knew? Was it that we shouldn't hate the Lutheran Church because just as Jesus loves us, we should--nah, too far-fetched. How about a cautionary lesson revealing how the spiritual world of faith-based talking animals and the secular world of commercial marketing simply do not mix? Well, maybe, but the mass-marketing of Lewis's Narnia appears to suggest otherwise. Reaching across my desk, I pick up my one piece of Davey and Goliath merchandise and give it a gentle squeeze. The talking Goliath doll looks up at me with sad, soulful eyes, but says nothing. From the December 14-21, 2005 issue of Metro Santa Cruz.